Starting off this new music round up with The Phantom Sound. The background information goes as follows - Marisa is currently completing her first solo album. Her influences include artists from the late 70s and early 80s punk and new wave movements such as David Bowie, Roxy Music, Blondie, The Ramones, and Duran Duran. She is creating powerful, emotional, and honest songs inspired from that era, and combines it with rock in a new way. On An On - 'It's Not Over'. Sometimes videos really can add something to a song. The music stands on it's own, the video just takes you somewhere, a kind of journey, oh enough words, give it a viewing and brighten up your day! Presenting Welsh folk-rock duo Zervas & Pepper. I am reliably informed that - They make the phenomenally chilled-out old Laurel Canyon sound along the lines of Mamas and the Papas, The Byrds, and Crosby, Stills, and Nash. The new album Abstract Heart is the perfect soundtrack to summer driving. Actually some fair comparisons perhaps, I would add they make very good Welsh folk come country come rock music. Add to that that interest is picking up in the UK with mainstream radio airplay and Mojo magazine giving them the big thumbs up, the quality of their music is setting them apart. More Here. An Australian Triple Play? - Why Not! All about Edie Green - Straight off the back of a sold out launch and a hot 4 out of 5 review from The Music for their EP 'New Heavy', Perth's Edie Green are ready to spread their gooey brand of indie rock to ears across Australia. 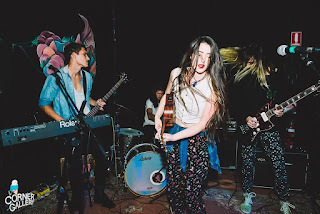 Their sonic melting pot is a result of uninhibited jam sessions comprising of jazz trained drummer Tyler, glam-rock/funk guitarist Conor, metal-minded bassist Elliot and folk/neo-soul singer Sophie. Together they produce an eclectic and dynamic sound that flirts from blues-rock to funk-folk. Another gem from the Internet Archive. This is Alabama Shakes back on the 13th November 2011 live at Ziggy's, Winston Salem, NC. 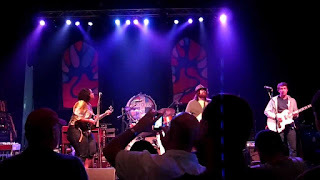 The band opened for Drive-By Truckers who declared themselves fans of the band and invited them on stage to perform 'Everybody Needs Love' that evening. Alabama Shakes is an American roots rock band formed in Athens, Alabama, in 2009. The group consists of lead singer and guitarist Brittany Howard, guitarist Heath Fogg, bassist Zac Cockrell, keyboard player Ben Tanner, and drummer Steve Johnson. The group received three nominations for the 2013 Grammy Awards: Best New Artist, Best Rock Performance for "Hold On", and Best Recording Package for their debut album, Boys & Girls. Michael Plunkett has this to say about his music - I have created my own style of electronic music which mixes aggressive big hitter drops with the sing along parts influenced by Southern California punk rock. Well with a mixture like that I was curious and needed to listen and mighty pleased am I that I did. Check out the track Nick Diaz, and his Facebook page is Here. Quoting now - JayKode’s infectious productions combine elements of trap, hip hop, and future bass, differentiated by his classically trained background. His versatility is unmatched, exemplified by a medley of remixes and originals associated with vastly different genres. Each release has gradually developed an inimitable sound known as “classical bass”. “Beehive” is the sonic representation of JayKode’s entire body of work, as well as his dedication to creating something new.